When Chez Papa opened our doors in 1999, our mission was simple - Serve good food, with friendly service, in the right ambience for a reasonable price. Many years later, our mission remains the same, that is, to give our customers the best possible dining experience that we are able to. Chef owner Dominique Muller is from Nice, France. Chef Dominique has worked in many restaurants around the world including Maxim’s de Paris, Singapore, Le Beaujolais, Bahrain and Le Souffle Restaurant in London. Siding to settle down in Johor Bahru. Dominique’s Malaysian wife and business partner Shereen Devendran has a degree in hotel and restaurant management and their team of three passionate local Chefs make up the Chez Papa kitchen crew. 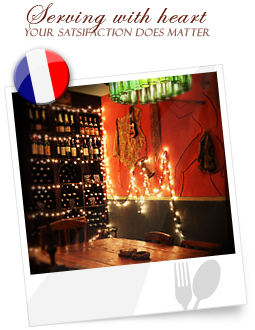 Regional French Cuisine with "heart"
What one great chef cannot accomplish, four passionate chefs can…. We don’t claim to be the best…just the most passionate..
Just great!!! The Best in JB for sure!! !